UCCE farm advisor Richard Molinar speaks about melon fly on the CBS Channel 47 news. CDFA officials have trapped a single male melon fly in a Fresno vineyard, sending shivers down the spines of local farmers who produce its target crops, including cucumber, eggplant, squash and tomatoes, according to a report on the CBS Channel 47 news. Red palm weevil larva emerges from its cocoon. Officials have confirmed that the red palm weevil is not confined to a single palm tree in Laguna Beach, according to a story in the Daily Pilot. Just blocks from the first infested tree, another Canary Islands date palm is being killed by red palm weevil. UC Riverside Cooperative Extension entomologist Mark Hoddle said the crown of the second infested palm has dropped off, and the top of the trunk is ringed with a 'halo' of palm fronds. Red palm weevils are quite large and have a slender snout. Palm tree growers, government officials and UC scientists are moving quickly to prevent the spread of red palm weevil, which made its first U.S. appearance a month ago in Laguna Beach, according to an article in the Riverside Press-Enterprise. The pest has caused enormous damage to palm trees in other parts of the world. Its larvae excavate large holes in the trunks of many types of palms - including coconut, date and oil palms, canary, queen and fan palms - killing a mature tree in about a year. Melon fruit fly is about the size of a house fly. Farmers and ag officials will gather at the UC Cooperative Extension office in Kern County at 6 p.m. Wednesday to discuss the recent discovery of five melon fruit flies southeast of Bakersfield, according to an article in Western Farm Press. 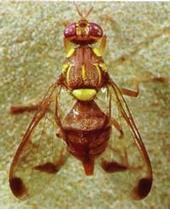 A native of Asia, melon fruit flies' only U.S. home currently is in Hawaii. However, CDFA says it poses a significant threat to a wide variety of agricultural crops important to California, including peaches, oranges, beans, tomatoes and most crops in the cucumber family. At a press conference in Fresno Wednesday, the Natural Resources Conservation Service announced a $1 million cost sharing program to help combat European grapevine moth in California.